"He can do, who can do" - Blue APK is a another blogger template by MS Design. Blue APK is best template for your android apps download site. Green APK Pro Responsive Blogger Template was our previous template for android apps and games download site. But in Blue APK we bring some awesome and big features. That make your blog more attractive. Blue APK is a responsive and seo optimized blogger themes, that make your blog more potential. In this template we used to big widget, Featured Apps widget and Featured Games widget. You can display 8 Apps and 8 Games as a featured post in top with specific label. Featured apps and games widget may increase your apps download count. Blue APK is a another responsive and SEO optimized blogger template by MS Design. Make a Responsive and user friendly android apps download site using blogger. Blue apk is grid style apps showcase blogger template. Our previous version was green apk. But Blue apk blogger template is totally different. In Blue apk, we bring some great features, like Featured apps, Featured Games, Recent Posts widget and many more. Hope all guys like this template. Free download blue apk blogger themes from MS Design. 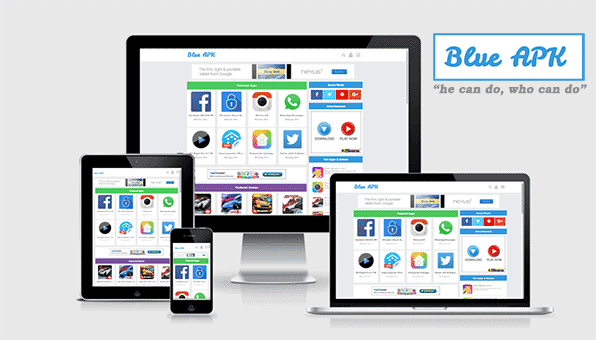 Blue apk is full responsive designed blogger themes for app download site. Facebook comment and blogger comment are used on this template together. Hope you will like this. On green APK blogger template, we were used Recommended Apps widget and Featured posts slider. But In Blue Apk blogger template we added two big features and that is Featured apps widget and featured games widget with specific label. you can show 8 posts as a featured posts on every widget. This two big features may increase your blog beauty and your blog traffic. Because users are always looking for most interesting thing. You can set featured posts whatever most interesting apps and games. That will help every visitors for find right apps and games. Blue APK blogger template is fully pure responsive designed blogger template. Just see our previously released all templates. Blue apk apps download template for blogger is also responsive which indicated that your website looks great on smartphones and tablet as good as they look on desktop devices. This template is compatible with all device. Responsive and mobile friendly blogger themes are most important in search results. So, use a proper responsive blogger template in your blog. A mobile friendly blogger themes play an important role. Cause maximum of visitors are come from mobile specially on android apps and games download site. So, its too much important to make your blog mobile friendly. Google also like a mobile friendly blog. Blue APK - Responsive Blogger Template. A new year gift ;) Demo: http://blueapk-msdesignbd.blogspot.com/Download link: http://goo.gl/JoJqfS"he can do, who can do"
Gan...maaf featured App dan Featured Games nya kq gk mau muncul y postingan nya...mhon bantu gan? cara nya gimana tolong diperjelas !! Can i change it little bit according to my requirment without any copywrite issue?? when i install the template then the two featured widgets not working properly. Not showing the 8 posts. whats the issue? Featured Apps is example label name. Type your Label name whatever you want to show on Featured widgets. i like the template but its featured widget not working properly? whats the issue ? Give a proper footer credit. apakah ada versi WP nya pak? how to remove facebook comment ? Thank You sooo much.....but when I am sharing my post on FB, how to change your name? Open xml file on Notepad and copy all codes. After that past all codes on Edit HTML and save template. You're done..
hello admin, page number is not show. can you help me. i have same problme please help me. why when I load a post and I stop when loading (unfinished loading) , my blog always direct to msdesignbd.com ? how to fix it ? mqybe i must edit css for it ? how to fix it ? Paypal chara ar ki diye pay kora jabe? Bangladesh theke hole, bKash and DDBL diye pay korte parben. but because he is focused on mobile at least .. Appreciate your work. I have 2 simple questions, and need some help, please. The pictures in the post what are the dimensions 200x200? And about the pictures post alignment, I need to use "left alignment" to be like in the demo, or it doesn't matter if is at center, and it will do an auto-align the picture? hello sir ,tks u for template but i want to get in tips games plz..
way i cant see post in f.apps and f.games ? I use this template, thanks for sharing ! How to make the featured apps that I can not please help me? YOU MIGHT ALSO LIKE is undefined how to fix?? It will be fix on update version. is failing home page redirects to MS Design, I have not removed the credits, the solution! I would buy the template, but I tried the demo and there are many errors, I also see in your test, what to do? It may take some times. i want to buy Blue APK Templates. sir, the page number only in premium feature desuka? I love your All Blogger Template.